The state of Guanajuato is famous for it's small, family-based tin workshops which provide employment for many local families. The tin here is still worked with the basic tools of ball hammer and lead plugs using methods essentially unchanged for a hundred years. Tin workers here have branched out from the original utilitarian objects such as candle holders, light shades and storage churns to objets d'art such as the tin boxes here. 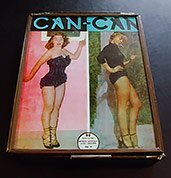 These vintage tin boxes are handmade in the state of Guanajuato, in central Mexico, by a small, family run enterprise which has been working with tin for generations. The designs are typical of the type of work carried out in the middle of the 20th century. The boxes are handmade using traditional tools and materials with a choice of colours for the side glass. Vintage tinware with a touch of retro glamour. Size: approx. 10cm x 13cm x 3cm. Choose your design and side colour below. 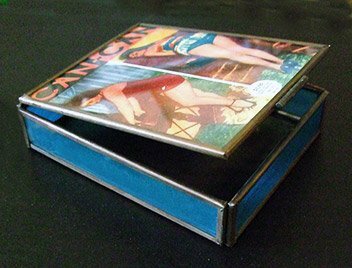 Handmade Hojalata (Tin Art) glamour boxes from a small, family run tin workshop in Guanajuato. Great for jewellery or simply for knick-knacks. Tin ware has always been popular in Mexico and many small workshops are still operating. Many of the utility items which were previously made are now mass produced and these family operations now rely on products of this kind for their survival.